The Bnei Menashe couples who were remarried at Kfar Hasidim. Photo credits: Laura Ben David, courtesy of Shavei Israel. 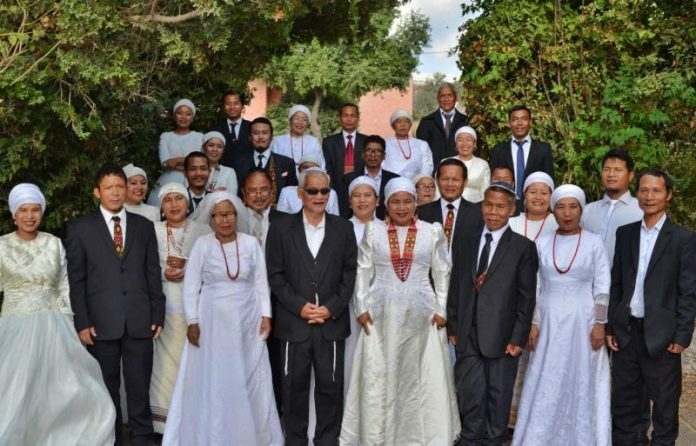 Fifteen Bnei Menashe couples, all of whom immigrated to Israel from Manipur, India, two months ago, were remarried this week in an emotional group ceremony at Shavei Israel’s absorption center in Kfar Hasidim after completing their formal conversion. The 15 couples were among 225 new Bnei Menashe immigrants who arrived in Israel in June thanks to the Jerusalem-based nonprofit Shavei Israel. They all hail from the northeastern Indian state of Manipur, on the border with Burma, which is home to the largest concentration of Bnei Menashe in India. The new immigrants plan to settle in the Galilee, in Israel’s north, after they leave Kfar Hasidim at the end of August. 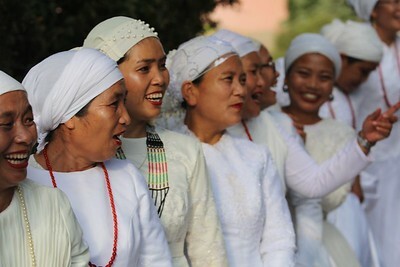 Some of the brides. Photo credits: Laura Ben David, courtesy of Shavei Israel. Sharon Hangshing, 79, and Hillel Hangshing, 80, at their remarriage ceremony. Photo credits: Laura Ben David, courtesy of Shavei Israel. 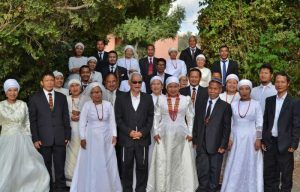 During the weddings, the brides had their hair and makeup done and wore traditional white wedding gowns, while some of the grooms wore traditional suits with Bnei Menashe tribal designs. 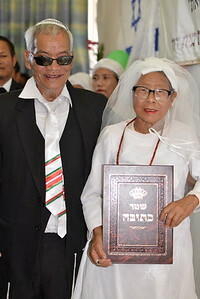 Among the couples who married were Sharon Hangshing (79) and Hillel Hangshing (80) from Churachandpur, Manipur, who have a married daughter and grandchildren living in the Israeli town of Migdal Ha’emek. The couple came to Israel with a widowed daughter and her two sons, and a single son. They left a daughter-in-law and her children behind. “I’m very excited! We wanted to see Israel with our own eyes but unfortunately our vision is weak. I feel like we’ve come home! Israel is like coming to paradise on earth. It’s not comparable to any other place. My excitement is beyond all imagination,” said Hillel. “If only our grandchildren who we left behind could come here and experience this as well,” added Sharon. The Bnei Menashe believe they are descended from the tribe of Menashe, sent into exile by the Assyrian Empire more than 27 centuries ago. Their ancestors wandered through Central Asia and the Far East for centuries before settling in what is now northeastern India, along the border with Burma and Bangladesh. Throughout their sojourn in exile, the Bnei Menashe continued to practice Judaism just as their ancestors did, including observing the Sabbath, keeping kosher, celebrating the festivals and following the laws of family purity. And they continued to nourish the dream of one day returning to the land of their ancestors, the Land of Israel. Previous articleMindbiz: Bossy Bride or Meddling Mom?